Each photo in this gallery is the result of spending a night under the stars, beholding vast mysteries, huddling in sleeping bags, warding off bats and coyotes, and loving every minute. 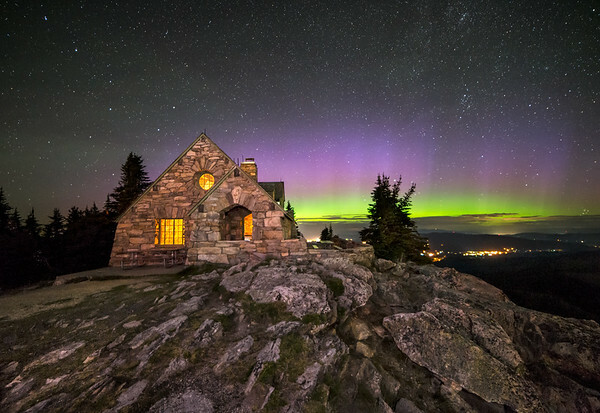 The Northern Lines shine behind the Vista House on the top of Mount Spokane. The lights of Priest River, Idaho and Newport, Washington can be seen on the horizon. 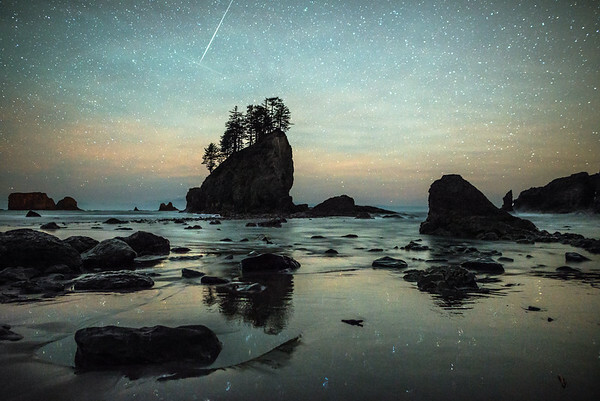 Two meteors converge in a single exposure above Second Beach in La Push, Washington, Olympic National Park. 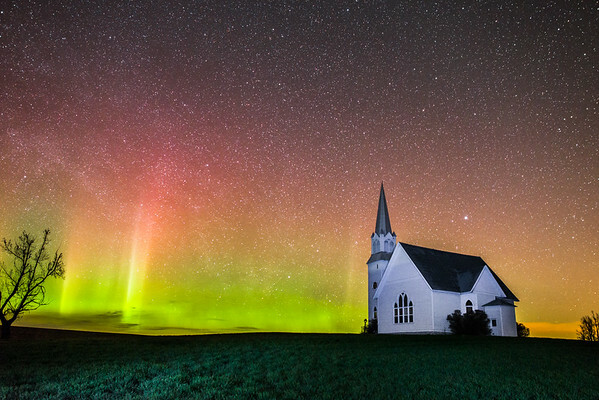 The Aurora Borealis erupts on the horizon beyond a little country church near Davenport, Washington. 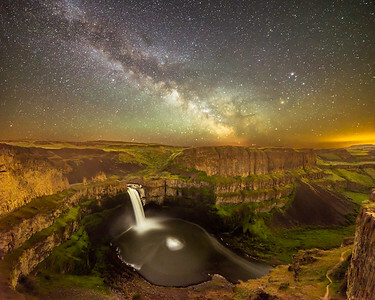 This was the last photo I took of Palouse Falls after five hours of trying different compositions that would do both the Milky Way and the falls justice. Sometimes you have to stumble around the dark for awhile before your creative vision matures enough to see what is possible. In this shot I sought to have both the falls and the Milky Way descending to earth with the same trajectory. 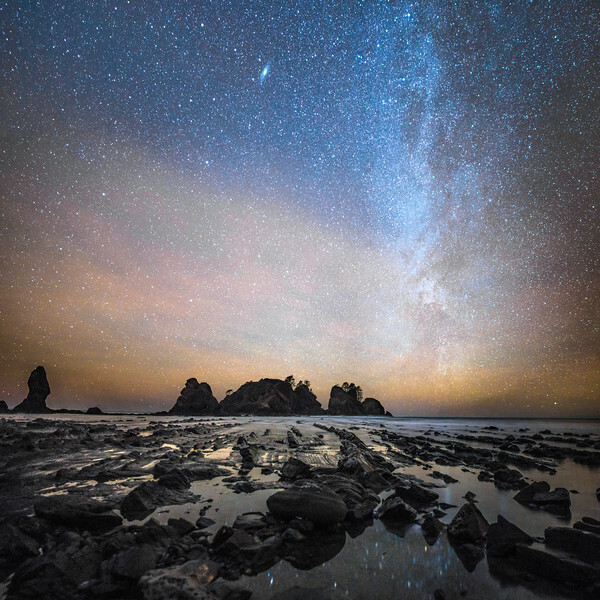 This is a combination of two exposures, one for the stars and one for the landscape. While waiting for the 10-minute-plus exposure for the land to complete I laid down on the ground next to the cliff and felt, for the first time, the vibration of the earth from the force of the water pounding into the canyon floor. Please note that your computer monitor will likely show this image being brighter and with less contrast than will actually appear in print. This version is edited and proofed for optimal printing and will have much more contrast and dark tones than what you see on your computer screen. 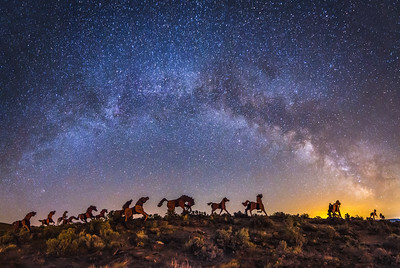 The wild horse statues of artist David Govedare ride into the heart of the Milky Way galaxy at Wild Horses Monument in Vantage, Washington. 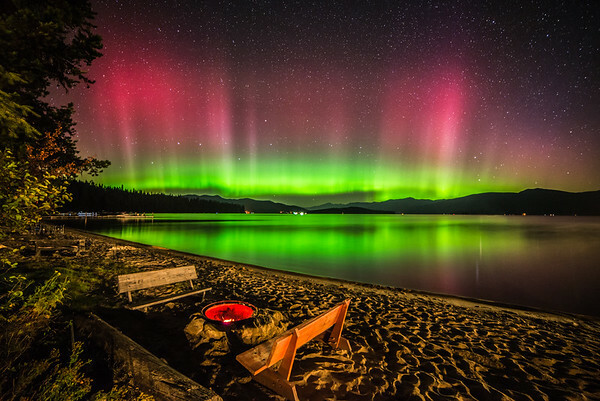 Northern Light erupt over Priest Lake from the beast at Hill's Resort in north Idaho. 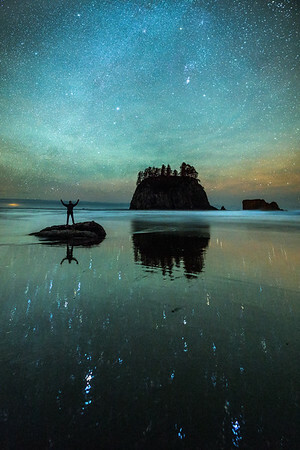 After a couple hours behind the camera in La Push, WA, Olympic National Park, I entered the scene for this photo. It reminds me of what it was like to wander the beach amidst the mystery of the stars, both in the sky and reflected at my feet on the beach. 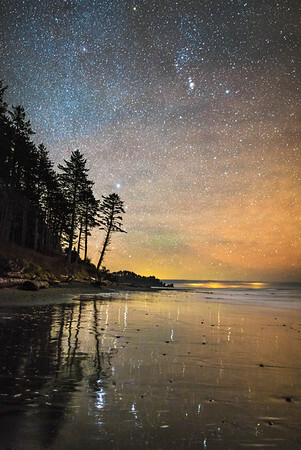 Star reflections on Second Beach in La Push, Washington, Olympic National Park. The Orion Constellation can be seen at the top of the image and the lights of coastal cities are reflected in clouds on the horizon. A receding tide reveals rock formations on Shi Shi Beach in Olympic National Park near Neah Bay, Washington. The Andromeda Galaxy is the bright feature in the sky along with the Milky Way Galaxy to the right. The yellow and orange colors come from a marine layer hovering over the Pacific Ocean. 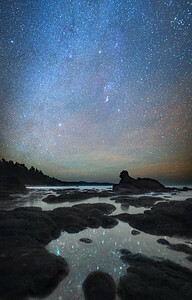 Stars twinkle in a tidepool at Shi Shi Beach near Neah Bay, Washington at Olympic National Park. 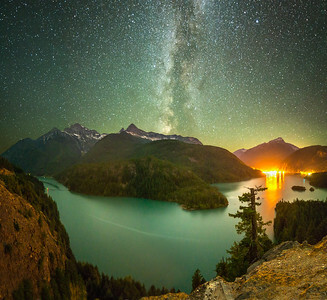 The Milky Way Galaxy rises above Diablo Lake in the North Cascades National Park in northwest Washington State. The lights to the lower right are from the dam that holds the deep blue waters of the lake. 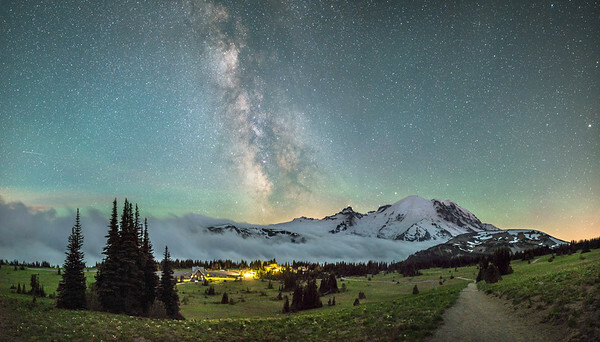 The Milky Way Galaxy slides across the sky over Mount Rainier and the Sunrise Visitor Center at Mount Rainier National Park. 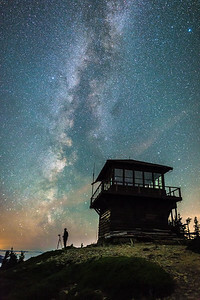 The windows of Tolmie Peak fire lookout, in Mount Rainier National Park, reflect the stars, as a photographer aims his camera in the direction of the Mountain. 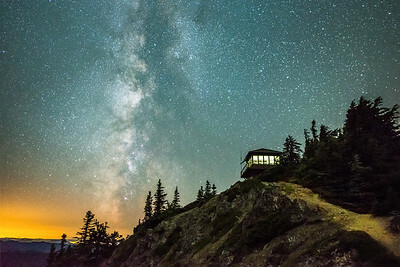 The lights are on inside Tolmie Peak fire lookout in Mount Rainier National Park, the lights are on in the Milky Way Galaxy, and the lights are on in the City of Portland as seen by the orange glow on the horizon. 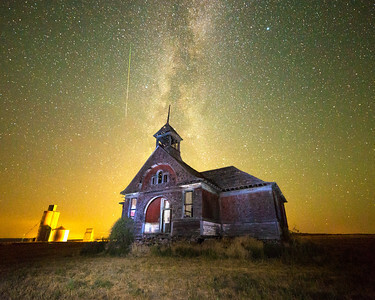 A Persedi Meteor streaks through the sky above the Govan Schoolhouse near Wilbur, WA. 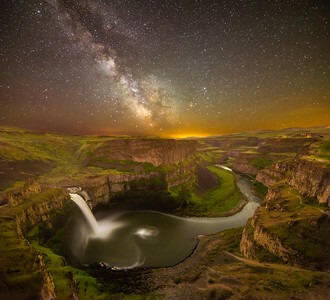 This was one of the last photos I took of Palouse Falls after five hours of trying different compositions that would do both the Milky Way and the falls justice. Sometimes you have to stumble around the dark for awhile before your creative vision matures enough to see what is possible. 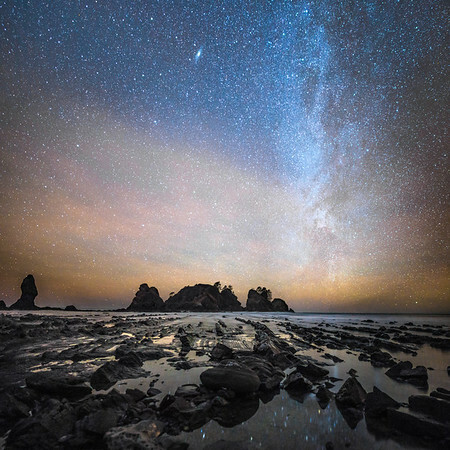 This is a combination of two exposures, one for the stars and one for the landscape. 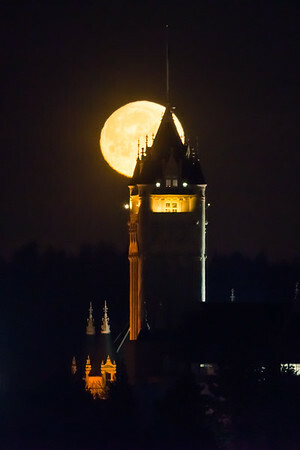 The lights of Walla Walla are visible on the horizon to the right. Please note that your computer monitor will likely show this image being brighter and with less contrast than will actually appear in print. This version is edited and proofed for optimal printing and will have much more contrast and dark tones than what you see on your computer screen. 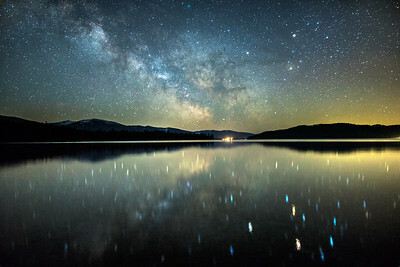 The Northern Lights and the Milky Way Galaxy are shown here from the Trail of the Coeur d'Alenes bridge over Lake Coeur d'Alene. The glow of lights from St. Maries Idaho are visible on the horizon at the lower right and lights from the City of Coeur d'Alene can be seen at the lower left. A Lyrid meteor is also visible at the upper right. 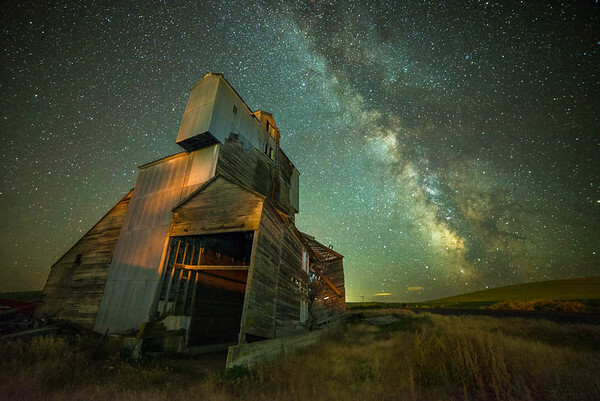 An old grain elevator on the Palouse near Pullman, Washington looks like an ancient decaying spaceship. 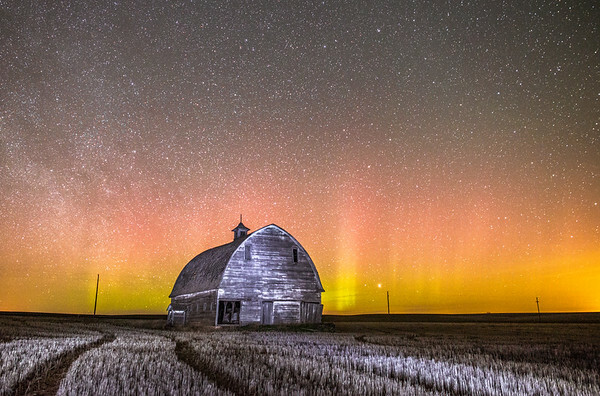 The Aurora Borealis rises in the distance beyond this old barn near Odessa, WA. 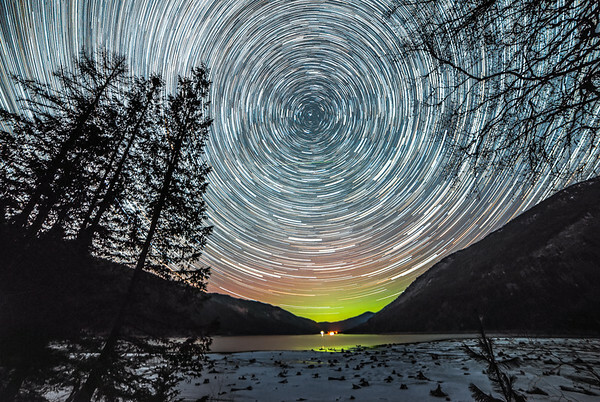 The Aurora Borealis bubbles on the horizon as the heavens rotate around the North Star in this composite of an hour of long exposures at Sullivan Lake in northeast Washington State. look closely for the meteors, an early offering from the Leonid meteor shower.